It's been quiet here at FFT, which is partly just the result of lots of other stuff going on; but it's also a sign that there's not been anything in the Miami food world that's gotten me excited enough to post. Happily, the latter of those issues got fixed this weekend. 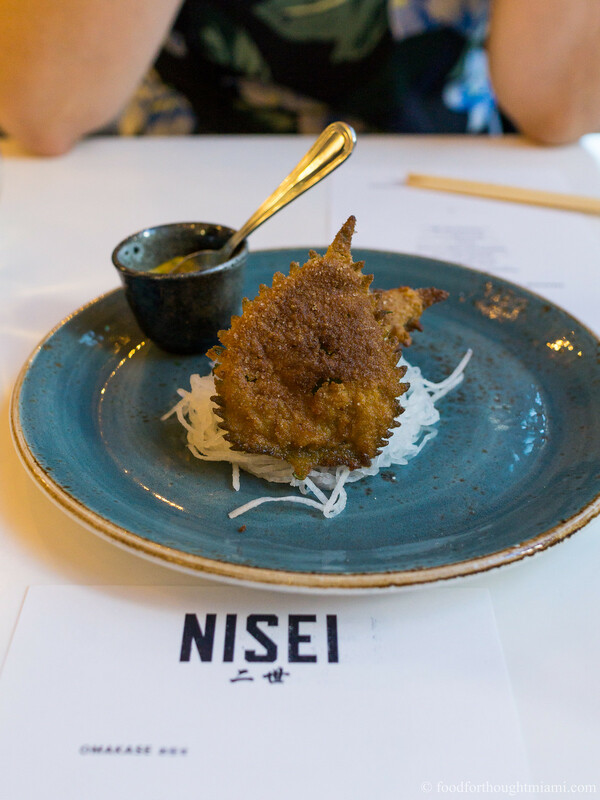 The fix was a dinner at "Nisei," a pop-up dinner series which is taking up residence for a couple evening weekends at B Bistro + Bakery in Brickell. It's the product of chef Fernando Chang, who had previously worked at 26 Sushi & Tapas in Surfside, together with Eric Saltzman (formerly of Taquiza and now at Dizengoff), and features an omakase menu of Nikkei dishes fusing Peruvian and Japanese flavors. 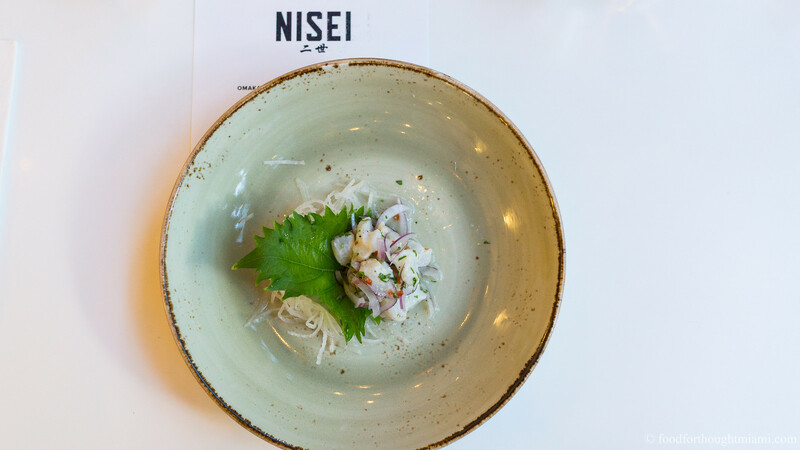 While this style of cooking is nothing new in Peru, where Japanese culinary influences have long held sway, Nisei's menu brought some smart new ideas and really nice execution, particularly considering our visit was on only the second night of service. (You can see all my pictures in this Nisei - Miami (Brickell) flickr set). The meal starts in mostly Peruvian territory: a ceviche of fresh locally caught grouper, marinated in lime juice and bright, spicy aji limo, and flecked with slivered purple onions and cilantro. It's easy to find ceviche in Miami – it's not nearly as easy to find one this fresh and clean. The next dish nods to both Peru and Japan: the fried shiso leaf is an item you'll find at Japanese tempura houses, but the sandy texture of the crisp fried shell is borrowed from jalea, a classic Peruvian fried seafood dish. 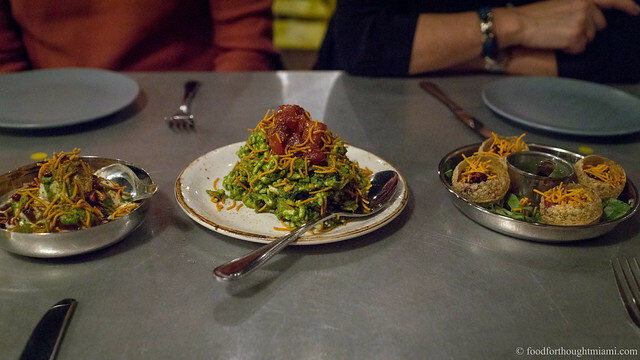 The leaf practically dissolves in one bite and a shatter of crumbs, and is served with a sauce that melds sarza criolla (an onion-forward salsa) and aji amarillo. It's good, but what I really want is for them to sandwich some uni in between a couple shiso leaves and then fry it (like so). 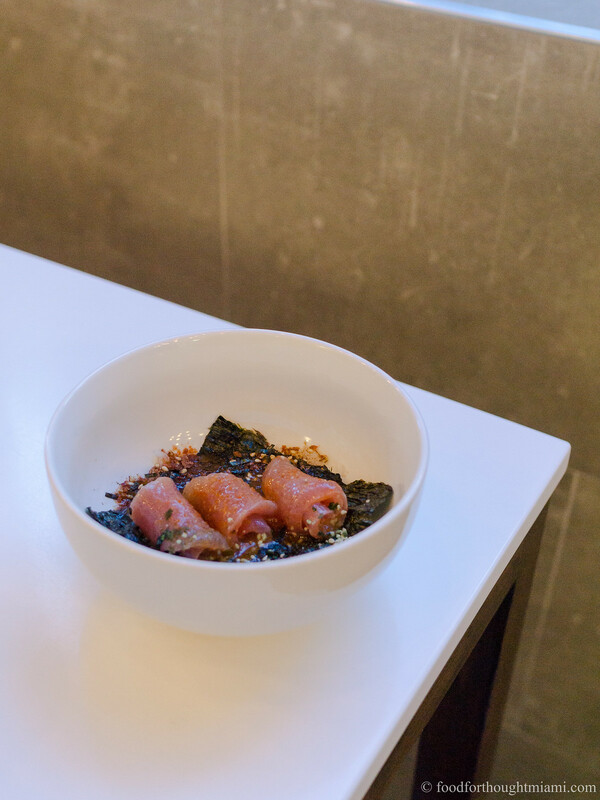 The next dish, maguro don, makes it all the way over to Japan, with a stop-off in Korea. Ribbons of lean tuna are mounted on a sheet of soft nori, nestled over short grain rice and kimuchi (an unfermented Japanese style kimchi), amped up with the rippling heat of Peruvian rocoto chile (Peru's not been abandoned entirely) and then rounded out with a bit of honey.